Pictured left to right: Kevin Brown (Beaches Watch Board member and Fletcher teacher), Christina Loss (scholarship recipient), and Sandy Golding (President of Beaches Watch). 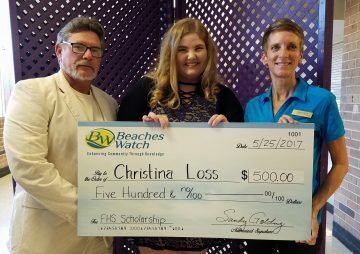 On Thursday, May 25, 2017 Beaches Watch presented our first ever Beaches Watch scholarship to a deserving Fletcher High School student who shares in our mission to preserve and improve the wonderful quality of life of our special beaches communities. Christina Loss was selected for her excellent 500 word essay describing what she would do to improve the quality of life at the beaches. We are pleased to give Christina a $500.00 scholarship, thanks to the generous support of the Beaches Watch membership! I have lived in the Jacksonville beach area my entire life. Witnessing the growth and prosperity of my hometown has been inspirational, and I strive to be a part of that positive change for as long as I am a member of this special community. Through my efforts, I hope to initiate and inspire continuous, preventative and progressive progress that will ensure the health and wellness of the Beaches community for future generations. After I graduate I will begin my studies locally as a Biology major, and this scholarship would be a tremendous monetary aid in my endeavors to bring what I have learned about conservation back to our community. I believe that the best way to ensure quality of life for both the ecosystems and the people in our beaches community is to raise awareness through education. Motivating others to participate in community activities and local meetings, such as the ones that are offered by Beaches Watch every month, would raise awareness and spread change. Speaking up about issues you care about is imperative as well being able to communicate your opinions effectively. Personally I could improve the quality of life at the beaches by continuing my active participation in beach cleanups and annual activities, such as the planting of sea oats and volunteering at the Right Whale Festival. I believe that informing those around me about all the wonderful opportunities to enrich our community is a great start. Informing others about the Beaches Watch website, as well as their monthly meetings, would help promote civic duty. By attending these meetings, they will have a better understanding of what is going on in our community and will be aware of the opportunities that they have to volunteer and spread the word. I also plan to participate in the making of signs to display around the area as well utilize social media to ensure that more people would be aware of the happenings going on around them. People in my generation are especially reliant on social media for their news, and so this is a great untapped resource. I would like to propose a local beaches government legislation that would strategically place recycling bins next to each trash can found around the beaches community. I believe that this would be a helpful legislation because it would reduce the amount of trash in our beaches community, as well as promote recycling items that are plastic and harmful to marine life. The impact that plastics have on our beaches environment can have a deadly toll. Over one hundred thousand marine animals will die from eating or becoming entangled in plastic each year. Plastic bags alone can take up to one thousand years to break down and can be often mistaken as jellyfish to sea turtles, dolphins, and whales. Plastics are one of the most commonly found items in beach cleanups, coming second only to cigarette butts. The impact that plastics have on the environment, in and out of the water, has been proven as fatal. Therefore, I believe that this legislation will have a very positive impact on our community and will save the lives of many of the animals found in it. In conclusion, I plan to be a valuable member of my community through education, and participation, and communication.